I'm a big believer in understanding why. Actually, in finding your why. Why do you do what you do? 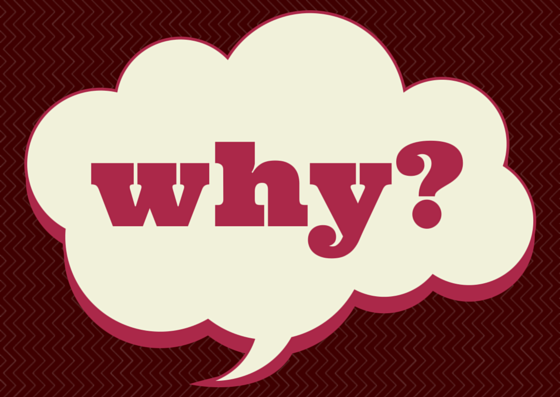 On my education blog I have written about finding your why. My why is service. I even have it tattooed on my wrist. I'm reading A Confident Heart Devotional. This morning's devotion was about Gideon asking God why. I might add here that I was reading the devotion with B man's feet in my back. He'd crawled in our bed at some time during the night was was sleeping sideways between Ryan and I. His feet were in my back and his head in Ryan's. When we started this autism journey I noticed a lot of literature, research and blogs about the why of autism. Why did kids get autism? How did they get it? I decided early on that I didn't care about the why or the how. Those were things I couldn't do anything about. Those are things that would likely drive me mad if I dwelt on them. The fact is he has autism. What are we going to do now? is a better question. How can we insure that Brennan will learn and grow and thrive? is another good one. I'm not at all interested in curing B's autism. It makes him who he is and he is fabulous. My job with Brennan is the same as my job with Sam and Zac. How can I equip them to love the Lord and seek His will for their lives? Those are things I can control. So, this morning Gideon asked God why. And God didn't tell him. God replied with Gideon's next action steps. There is a tension inherent in asking why. Lamenting why something has happened will drive you crazy. You will question God (which he doesn't mind at all) and it may diminish your faith. But knowing why you do something is powerful. That kind of why helps direct your path and provides reassurance at times. It's the action steps that matter. Boldly going without knowing why you are going. Trusting and believing that God is in control. That's where the rubber meets the road.